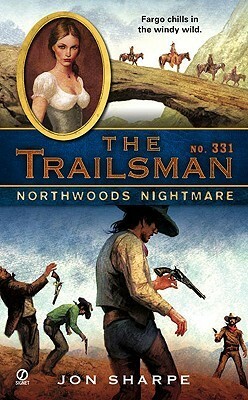 I have long been a fan of The Trailsman series. It is my fast food for the brain. I used to buy these books from the bargain book stores but now Kobo has them listed for a very decent price. The series features the adventures of Sky Fargo, who travels throughout the West picking, answering to no one, picking up a few jobs, mostly as a guide or scout and, of course, rescuing those in distress. Beginnings ... they bend the tree and they mark the man. The Trailsman' is what they began to call him all across the West: searcher, scout, hunter, the man who could see where others only looked. Skye Fargo, the Trailsman, and the seeker who could take the wildness of a land and the wanting of a woman and make them his own. I wondered if there was a book in the series that took place in Canada and low and behold I found it, Northwoods Nightmare, book 331 in the series. The trailsman deals out hot lead in cold country Skye Fargo is guiding a well-to-do Harvard family through the chilly wilderness of British Columbia with the hope of finding their gold-prospecting son, who hasn't contacted them for months. Before the job's done, Fargo will find himself battling enemies within the camp, killers without, and a rich girl who likes her men hard and dirty-like the Trailsman. This book was a fun read. As usual, every chapter has action in it and, yes, woman do want Sky Fargo. The storyline was interesting as was the ending. I am unsure that the author has been to British Columbia but they sure love it and spoke highly of its rugged beauty. As he rode, Skye could even picture settling there once his wandering days were over. It was a fun read, especially for a fan of the series. Ha, I got a chuckle at your comment about Teena saying I'd oust you from the Canadian Book Challenge for this choice. Au contraire. Last year on my blog I may have reviewed Voltaire, but I also reviewed Archie comics and MAD Magazines, so I'm not a complete snob!